It was the busiest lot in all Ocean Beach this morning – August 21st – at 7:30 on the 4700 block of Santa Monica Avenue – across from OB Elementary. Church volunteers, homeless people, and community activists were gathering for an early morning breakfast and scheduled alley clean-up. Patty and I arrived at that moment, half asleep but ready with our work clothes. A while later and by time breakfast was served – a regular thing every Saturday morning at this site – a hundred people had gathered. 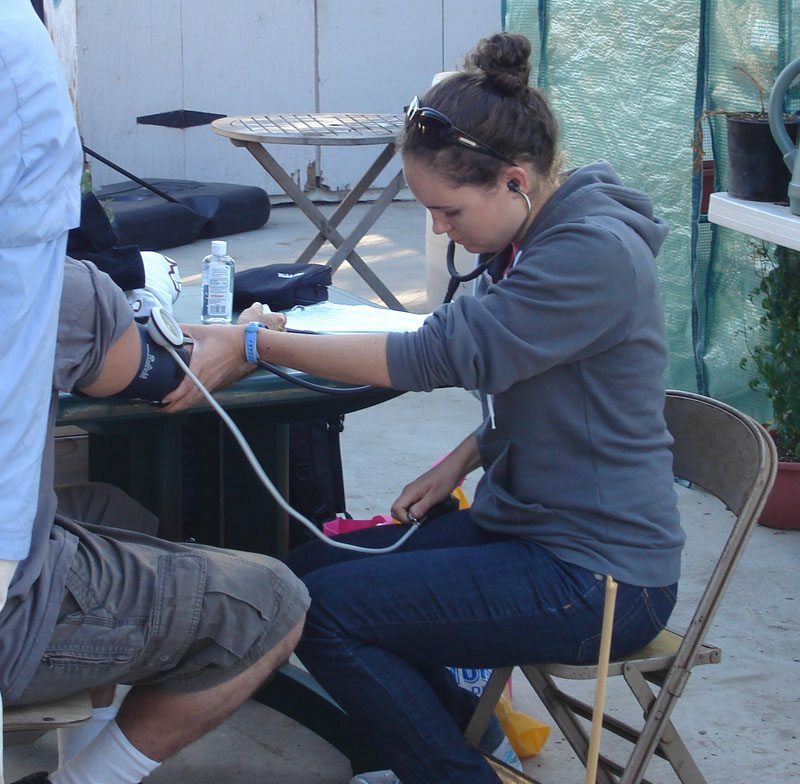 Some guys were singing and playing a guitar, med students from UCSD were taking blood pressures, and houseless people were collecting food, soaps, and other personal hygiene items handed to them by a half dozen good-natured souls who had arrived early and stood behind tables. A good proportion of the crowd were standing around waiting for the go-ahead for the alley clean-up. Finally, one of the pastors led us in counting off numbers to see how many were there for the work. Thirty people shouted out numbers and we were organized into four groups. The folks ready for the clean-up seemed to be mainly volunteers from the various churches. Colleen from the Green Store was there representing the local environmentalists. Craig Klein was there representing the merchants. Patty and I were there for the OB Rag. Glyn Franks and Jack Hamlin were of course there. And I don’t know the names of all the folks who had showed up with work gloves and a few rakes and brooms, but it was mostly an older crowd. I didn’t see that many individuals who had been at the first community forum on homelessness back on July 6th. After all the ceremony was over, we were grouped into the four work crews, each given at least one alley, and set on our way – everyone had gloves and plastic bags, and some of us had brooms and hand-held “picker-uppers”. We had one homeless guy in our group, and he worked hard. After about an hour and half, our bags were full and we were hot and tire. But for that time, all over the Newport Ave area, small grouplets of people bending over were seen up and down the back streets of the coastal village. Several people had thanked our group as we went about our dirty job. 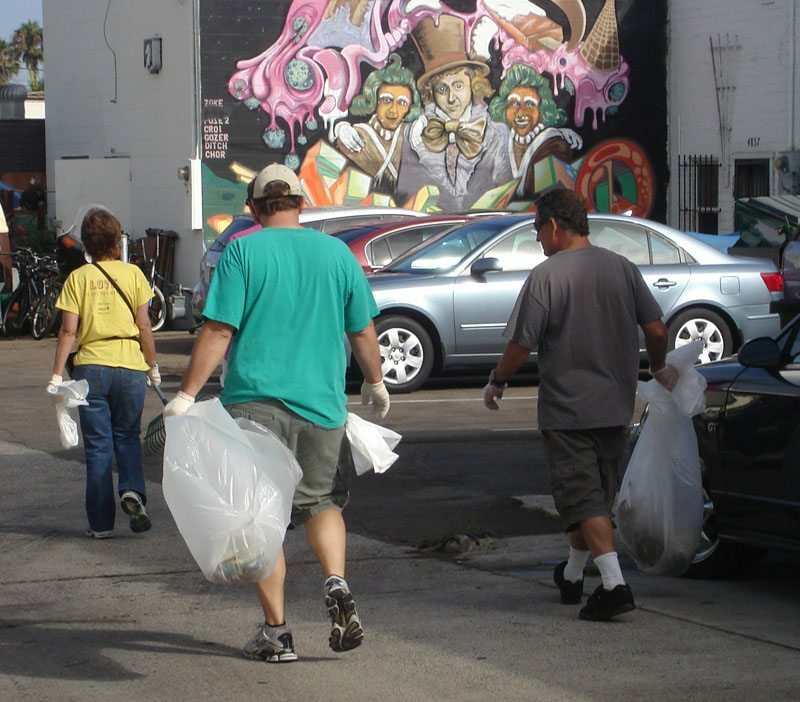 Originally, the alley clean-up was meant to be a way for the community to come together – and work together on something positive. That it was. Yet it was only part of the community. But the busiest part of the community on this Saturday morning. Here is the full gallery of our photos from today. Remember to click on the photo for a larger image. I had to work today but I wanted to thank all of you who were out picking up trash in our neck of the woods.) You are awesome. At this breakfast they hold every Saturday how many do they regulary feed ?? What was the total who cleaned n swept today ? Thank you to all for helping OB! 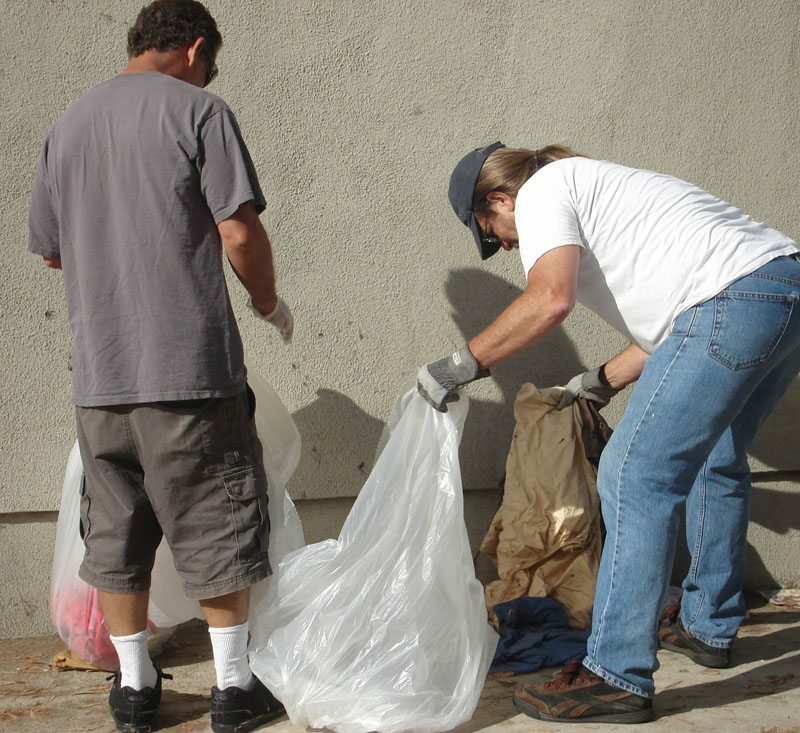 Sound like a success and maybe it might be a good idea to have alley clean ups every season along with some breakfast yummies. Next time around I will bring some homemade cookies to share. Wish I were there. 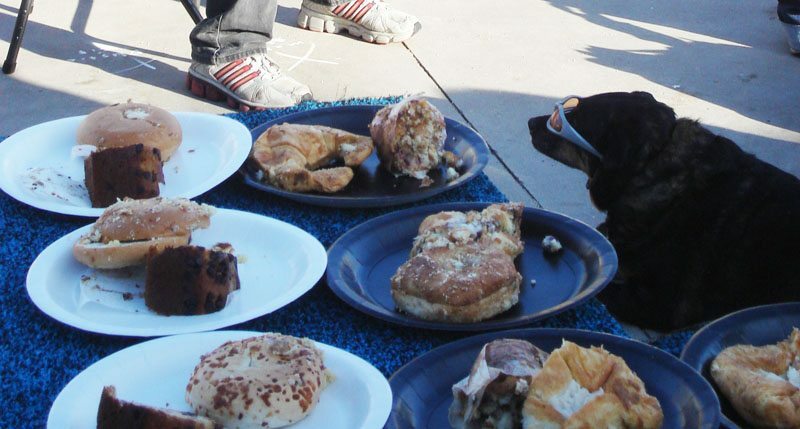 I had a commitment to volunteer at the Stone Brewing Co.’s 14th anniversary beer festival. 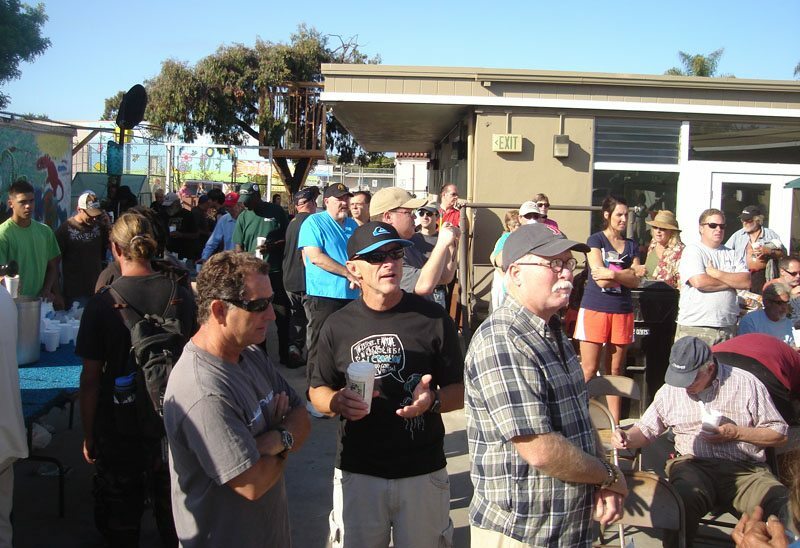 We raised more than $30,000 for charities like Surfrider Foundation and Boys & Girls Club. It was a great day. But I applaud everyone’s efforts here in OB. You know I’m up for the next clean-up. Let’s do another one soon!! hhmmm…guess I’m one of those “older community activitists” types? ;-) I actually just think of myself as a resident of OB who is committed to being a good neighbor to all. This was a good event… where, together ,we took action. I look forward to continued opportunities to be part of the solution to problems we try to resolve at the upcoming community forum scheduled for Tuesday night. Nice report Frank. Was there any info about it put out, beside the churches? I didn’t see any. Ah, jettyboy, the mighty pages of this here website had all kinds of notices, plus the special emails I sent out about it, so yes to your first question. The OBMA did have a notice on their website. Did the OBMA post anything ?? I know the Beacon ran a short blurb…. Wouldn’t it be great if the city would send it’s street sweepers down the alleys of beach areas a few times a year.Every other month? Quarterly? Only during the months where there is little rain? Oh yeah,we have no money. Actually Sarah,I think most folks do pick up the garbage that can be picked up in the alleys.”The alleys we cleaned weren’t as dirty as we anticipated”. My neighbors and I clean the alley behind our place.What a street sweeper would do is clean the grime,urine smell,oil stains,etc. off of the pavement.I don’t own a street sweeping machine or I’d do it myself, hence the need for a government agency to do it.With water restrictions in place you aren’t even allowed to use the hose to wash it down. Thank you so much for representing Frank and Patty! Yes, we should clean up garbage, we shouldn’t litter either. But, just to point out, government agencies are US. They are hired by us theoretically, and also, theoretically, they should clean up garbage more efficiently and safely than us. If that isn’t true, we’re failing our community by not insisting it is true. Since they’ve taken away the garbage cans at the end of Narragansett, Del Monte and gosh knows where else AND they have started charging $70 for residential garbage cans, we have less power to encourage proper garbage disposal by individuals. 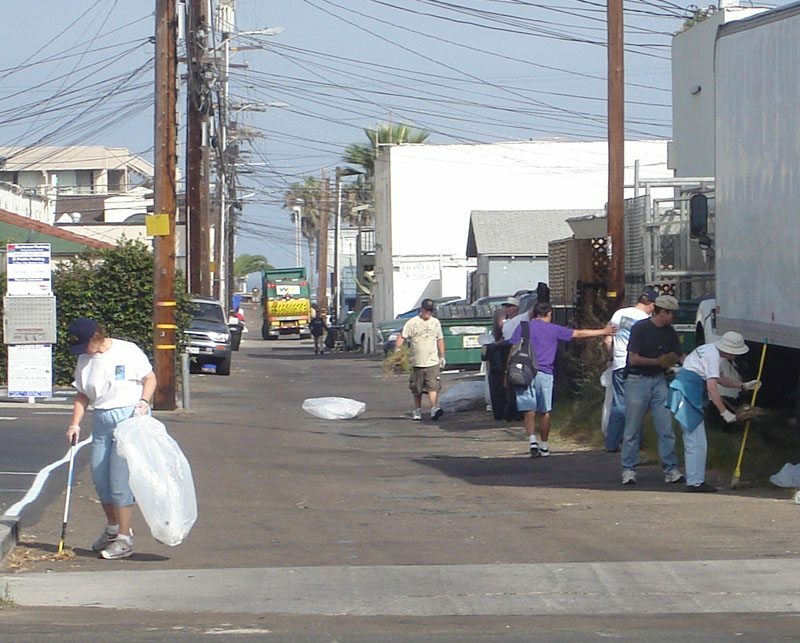 Many thanks to everyone who participated in the clean up of the alleys last Saturday. I know the individual merchants along those alleys were pleasantly surprised to find their alleys being cleaned. Thanks also to Claudia Jack for providing tools, trash bags and getting a free dumpster donated for the day. Thanks again.